STAMFORD — If not for tardiness, a lack of seats and a chance encounter with New Canaan football coach Lou Marinelli at the FCIAC awards dinner 25 years ago, Stamford’s Mike Walsh may never have become a Hall of Famer. Walsh arrived late for the dinner and seeing no seats at the Stamford Catholic table, he grabbed an open seat with the New Canaan contingent next to Marinelli. Walsh told Marinelli how Catholic needed a new football coach, and Marinelli was quick to recommend his friend Rich Albonizio, who eventually took the head football coaching job at Catholic. A few years later, Albonizio brought in a kid from Port Chester he hoped would help the football team, but instead changed the course of the Crusaders’ basketball program and Walsh’s career. That player was Rashamel Jones and while he never played football, he did help lead what became Trinity Catholic and Walsh’s first FCIAC championship in 1993, setting up a legacy of great players at the school and taking Walsh from a .500 coach to one nearing 600 wins with six state and FCIAC titles on his resume. 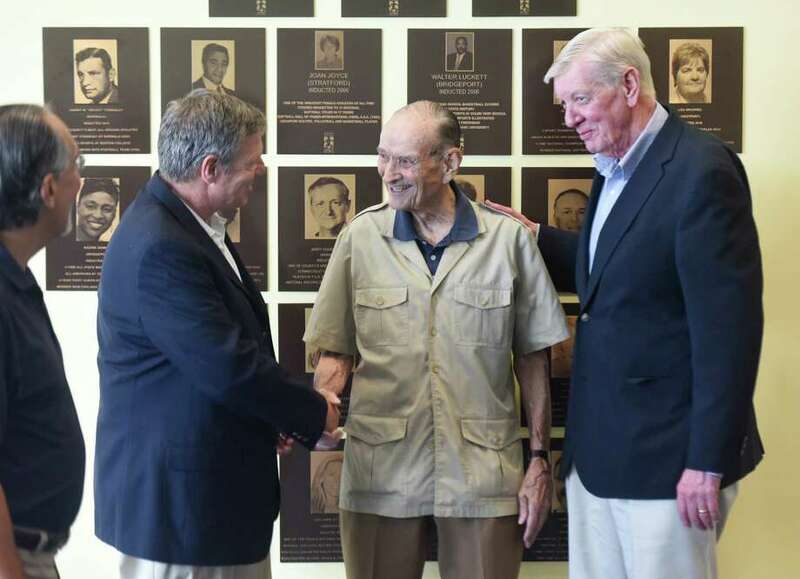 It was therefore appropriate that both Walsh and Marinelli got the call from the Fairfield County Sports Hall of Fame the same year and will be going into the J. Walter Kennedy service wing side by side. The Fairfield County Sports Hall of Fame announced at a press conference Wednesday at UConn-Stamford it will be inducting seven new members. Three members will be inducted into the James O’Rourke amateur wing with two going in to Jackie Robinkson professional wing and two into the service wing. Former WNBA All-Star Rita Williams of Norwalk and PGA golfer J.J. Henry of Fairfield will be honored in the professional wing. In the amateur wing by former University of Bridgeport basketball player Manute Bol will be inducted along with five-time Olympian Bill Steinkraus of Darien and Maurice “Wilky” Gilmore, who led New Canaan to three state basketball championships. They will all be part of the 12th class to enter the Hall of Fame when they are formally inducted Oct. 17 at the Hyatt Regency in Greenwich. Walsh has been the head basketball coach at Trinity for 37 years, amassing 596 wins (fifth all time in the state) with six FCIAC championships and six state titles in 12 state championship game appearances, including seven straight from 1999-2005. Walsh also coached Stamford Babe Ruth teams for over 40 years, taking several to World Series appearances as well as coaching many years in Stamford Little League. About to enter his 36th season leading the New Canaan football team, Marinelli now has 319 career wins (300 at NCHS), 34 consecutive non-losing seasons, 11 state championships and five FCIAC titles. Marinelli is first among active coaches in Connecticut in wins, and third all time. He is also a member of the CHSCA and FCIAC halls of fame. After graduating from McMahon, Williams played at UConn before moving on to the WNBA. There she played six seasons with Washington, Indiana and Seattle. During her time in Indiana, Williams was selected for the 2001 WNBA all-star game and was the team’s leading scorer, putting in 11.9 ppg in 2001. In her career she played in 186 games, scoring 1,185 points, hauling in 369 rebounds and dishing out 405 assists. Henry, a Fairfield High graduate, turned pro in 1998, playing 460 events in which he made 297 cuts. Henry earned over $15 million in winnings including three tour wins, five second place finishes and 36 top-10 finishes. He won the 2006 Buick Championship in Hartford for his first tour win and was a member of the U.S. Ryder Cup team in 2006. Henry and Williams were not able to attend the press conference announcing the inductees. Steinkraus, 90, was a five-time Olympian and the first American to win individual gold medal in equestrian 1968. He also won three other medals, two silver, one bronze making him the most decorated Olympian from Fairfield County. He was also captain of U.S. Equestrian team for 17 years and president of US Equestrian Team for 10 years and became a member of the National Show Jumping Hall of Fame in 1987. He first rode at Ox Ridge Club in Darien in 1938. Gilmore was a three-time all-state basketball player (1956-58), leading New Canaan to three state titles. He is the school’s all-time leading scorer, also lettering in football, track and golf at New Canaan. The 6-foot-6 Gilmore was a three-year starter at the University of Colorado (1960-62) and is top 25 all-time in scoring with 1,026 points while also pulling down 591 rebounds. Gilmore led Colorado to consecutive Big Eight titles and to the NCAA Midwest regional finals two straight seasons before losing out on a Final Four spot to Cincinnati both years. Gilmore was drafted in 14th round by the NBA’s St Louis Hawks in 1962. Gilmore died in 1993 at 53 years of age. The 7-foot-7 Bol, in his one season at Bridgeport (1984-85) created the greatest single season of excitement in school history. He averaged 22.5 points, 13.5 rebounds and 7.1 blocks per game. The team, which previously drew 500-600 spectators, routinely sold out the 1,800 seat gym. Bol went on to a 10-year NBA career as one of greatest shot blockers in basketball history, ranking 15th all-time with 2,086. Bol died at age 46 in 2010.